One of the refreshing and exhilarating observations since I joined Trade Ideas LLC this past summer is the relentless pace of product improvements. On a nearly weekly basis, our Dev team is pushing out new features, improvements, or back end efficiencies to improve performance. Trade Ideas is truly a company founded by Traders, built by Traders, and forTraders. For existing subscribers running our public production version 4.2.5, what follows is a partial list of notable upgrades in recent beta versions. Don’t let the term “beta” scare you. Our latest public beta version (download 4.2.28 for free here) is remarkably stable and there have been very few noticeable bugs. I encourage you to download and see for yourself. Easily visualize suggested smart stop and profit target levels. 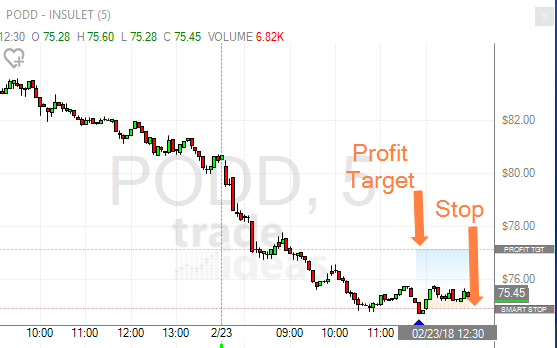 Now all Trade Ideas charts will graphically display suggested stop loss and profit target levels for anyone thinking about entering a day or swing trade at current prices. These levels are generating by synthesizing inputs from average true range, volatility, and recent support/resistance levels. These levels are merely suggestions, implying that outside these ranges, your trade begins to have odds and statistics stacked against you. Quickly view past HOLLY trade entries on daily charts. This is tremendous for displaying the value of HOLLY for those wishing to use her signals for longer-term swing trades. You’ll be able to visualize if HOLLY has any edge in a stock you’re considering entering a position in and you’ll see huge alpha on display in some cases. View a list of past HOLLY trade details. Now you can go back to view as many as three months of past HOLLY trades along with all the attendant details you see intraday. 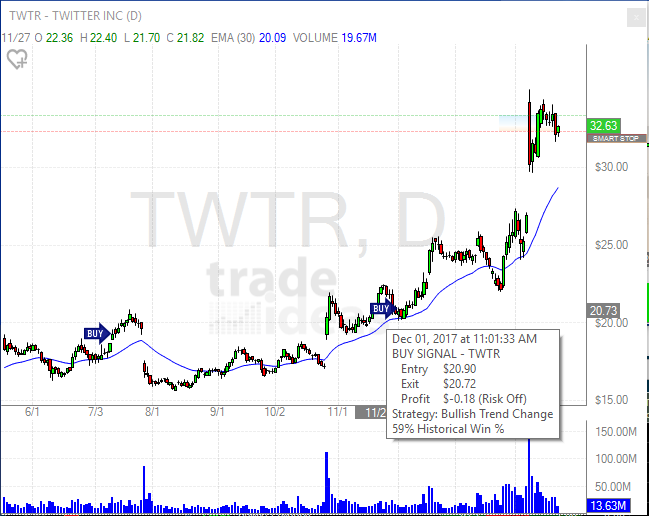 This is another great resource for those with a longer than day trade time frame or an interest in seeing volume of past activity. 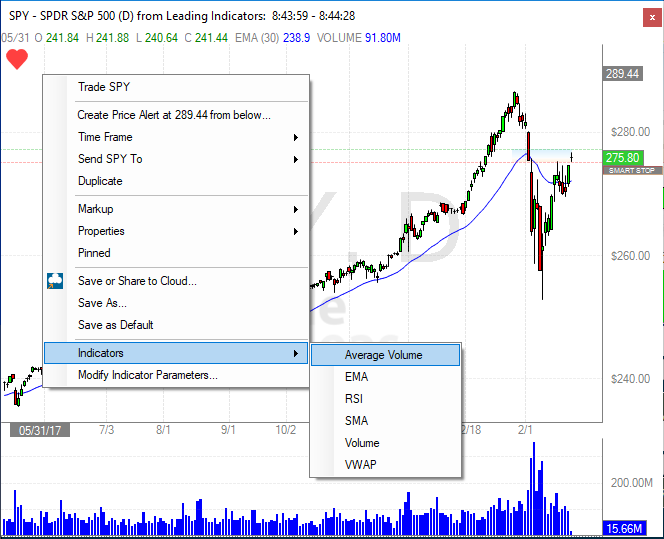 Trade Ideas Charts now feature popularly requested indicators: average volume, exponential moving averages, simple moving averages, RSI, and Volume-weighted average price (VWAP). We’ve added new pre-configured channels: Blockchain & Cryptocurrency, Swing Trading, and My Liked Symbols to help you better zero in the opportunities most meaningful to you. Create Watch Lists easier, with a dedicated page. 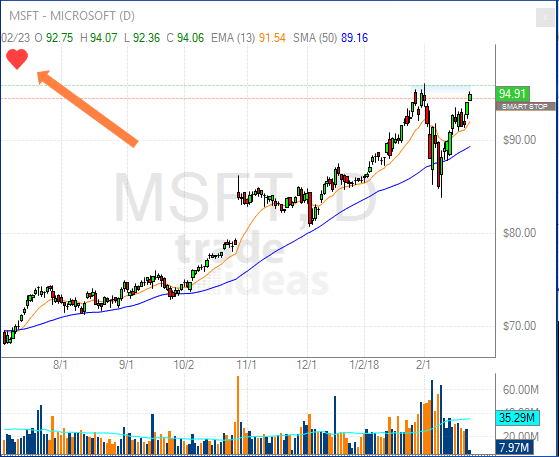 Whenever viewing a chart in Trade Ideas of a stock you wish to keep tabs on, simply click the heart in the upper left of the chart to make it red (see below). This stock will now appear in your My Liked Symbols Top List for easy reference on the new My Liked Symbols channel found in your channel bar. In 2017 and continuing into 2018, we’ve made great strides in getting the Trade Ideas web version near to parity with our downloadable version. This is great news for any users not running a Window machine or a Windows environment on their Mac. Chart Surfing! 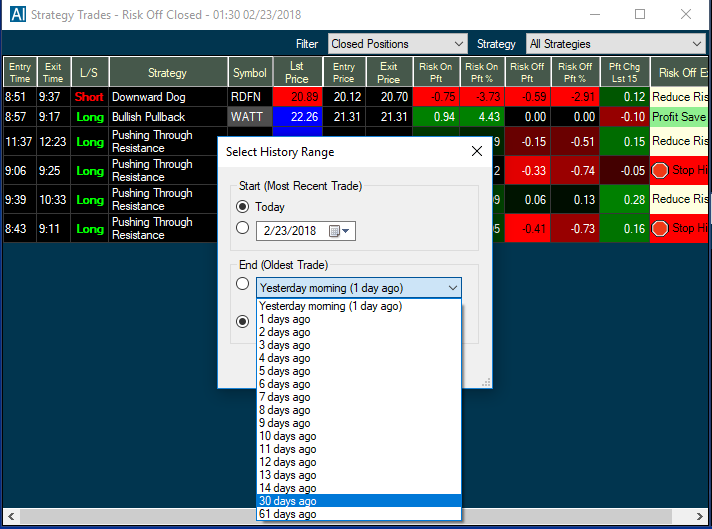 Now you can toggle on “Idea Surfing” and Trade Ideas will automagically surf through your open top lists and alert windows so that you can visualize all your important charts without clicking your mouse or typing in symbols. Look Mom, no hands! Speaking of charts, Premium subscribers can now maintain up to 20 charts per custom layout. And finally, our continued subscriber growth has afforded Trade Ideas the ability to add additional and very talented support staff with trading experience and the ability to serve expert level customers with needs in our beta Brokerage+ module and custom formulas, as well as additional support in training and billing. 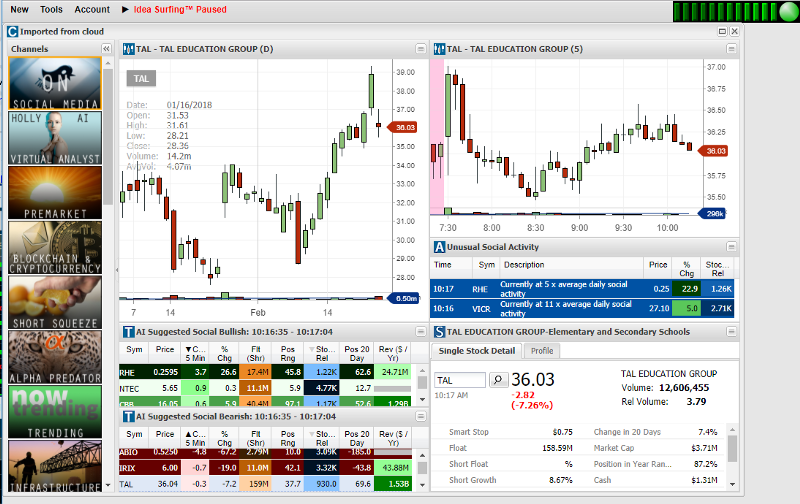 If you are a long time Trade Ideas subscriber running an older version of our software, are a former customer, or are considering trying trade ideas, we think you’ll be pleased with the latest features and developments in our industry leading idea generation platform. If you’d like to restart an old subscription or join us for the very first time, head here to review available subscription options.